Over 30,000 house fires were attended by fire and rescue services in the UK between April 2017 and March 2018. There are more house fires attended than any other type of fire; and unsurprisingly most house fires happen in the kitchen, and are caused in most cases by cooking appliances. However, statistically there are more deaths caused by smoking related fires than any other source. 90% of households now have smoke alarms fitted; yet 23% of those admitted to never having tested their smoke alarms. Even though it is now compulsory for rented properties to have a working fire alarm, it’s not something that tenants in general think about testing on a regular basis. It’s also worth noting that mains fitted smoke alarms have a lower failure rate than battery operated (22 percent vs 38 percent respectively). Reports show that on average, there are 25 carbon monoxide related deaths in the UK every year. The symptoms of carbon monoxide poisoning are so subtle, they can often be missed until it’s too late. The first sign is usually a persistent tension headache, but sufferers also reported severe dizziness, nausea, confusion, stomach pain, and shortness of breath. These symptoms will lessen or disappear once the affected person is away from the source of the carbon monoxide leak. If you or someone you know suspects carbon monoxide poisoning, they should seek medical advice as soon as possible. What is expected of landlords? 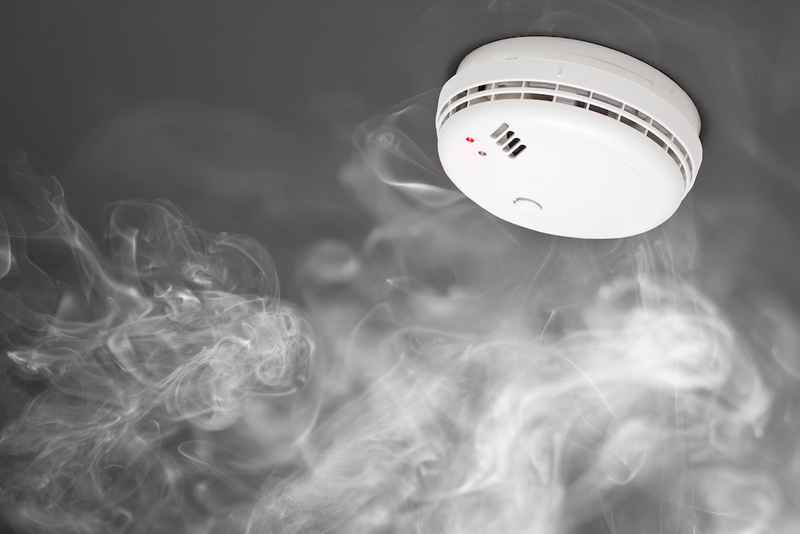 2015 regulations stipulate that all rentals must have a smoke alarm fitted to each floor of the property. These can be of either the mains fitted type, or battery operated, but they must be proven to be in full working order when the tenant signs the agreement before they move in. If there is a solid fuel or open fireplace in the property, there must be a carbon monoxide alarm fitted, even if the fireplace or range is meant for decorative purposes. It is advised that these are fitted at head level, at a range of between 1 and 4 meters away from the appliance. If the property does not have a solid fuel or open fireplace, installing a carbon monoxide alarm can still be advised, as low levels of carbon monoxide can be evident in faulty boilers, gas fires, central heating systems, or cookers. Both types of alarm should be tested on a regular basis (recommended monthly). This can be done by the tenant. Any faults should be rectified immediately by the landlord, with alarms being fully replaced if they are shown to be faulty. However, it is the tenants’ responsibility to change batteries in such alarms, and they should be made aware of this. Where should smoke alarms and carbon monoxide alarms be fitted? It’s recommended that smoke alarms should be fitted in circulation areas such as hallways and landings, and preferably fixed to a ceiling, or as high up as possible. These should be within easy reach so that they are able to be tested regularly without too much hindrance. Carbon monoxide alarms need to be within a range of 2 to 4 meters from appliances such as solid fuel or open fires, or boilers, cookers or gas fires where applicable. They should be placed at around head level if possible. If a local authority believes that a landlord is not in compliance with the regulations, they have the power to issue a remedial notice. The landlord then has up to 28 days to rectify any issues. Failure to do so could lead to a hefty fine of up to £5000 per property. Landlords need to ensure that for all new tenancies, all smoke alarms and carbon monoxide alarms are correctly fitted and are in full working order. After this, the tenant should be made aware that all alarms are their responsibility to test on a regular basis, preferably monthly, and report any faults as soon as they arise. It is the tenant’s responsibility to replace dead batteries in smoke alarms and carbon monoxide alarms. If access is required to replace faulty alarms, the landlord is required to advise the tenant in writing, stating that the installation of both smoke alarms and carbon monoxide alarms is required for the tenants’ safety.